Yup. You read it right! RM799 only. But you are a seasoned consumer in this telecommunications field, right? You won’t think that you will get it at RM799 only without contract, right? Yeah, to get Samsung Galaxy S II at this price you need to sign a 24-month contract of 3GB data plan with Maxis. 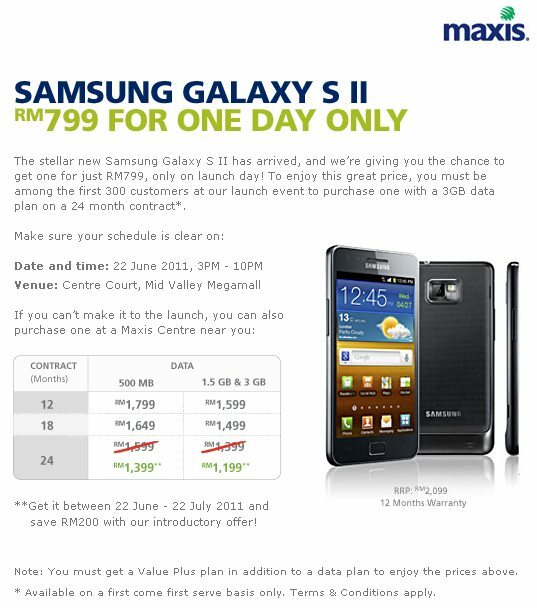 But this offer is only valid for the 1st 300 customers who buy Samsung Galaxy S II with Maxis 24 months contract of 3GB data plan on the launch day itself. The launch day is on 22nd June 2011 (Wednesday), 3pm – 10pm at Centre Court, Mid Valley Megamall. Don’t worry if you missed the launch date and the RM799 promotion. You still can get RM200 rebate when you purchase Samsung Galaxy S II with their 12, 18 or 24 months data plan contract from 22nd June 2011 until 22nd July 2011. So, will you queue up on the launch day of Samsung Galaxy S II at Mid Valley Megamall just to get it at RM799? dude.. r u the johnkor which is the TS for few Versions for Desire HD in LYN? Next story Motorola Xoom 3G Is Available in Malaysia & Price is RM2,599!!! Previous story Facebook Official iPad App is Coming!! !